Jose Bautista’s sizzling start to the 2011 season has Toronto Blue Jays fans practically foaming at the mouth, and with good reason. After all, isn’t getting way too excited way too early one of the best parts about being a sports fan? ( Just ask the guy who bought this jersey.) But leave it to sports media to take an already ridiculously hyperbolic sentiment to the next level. In the last week, local commentators have not only anointed Bautista the best hitter in baseball, but they’ve even gone so far as to even call him the Jays’ greatest slugger—ever. Sure, he may be in the midst of one of the most impressive stretches in the ball club’s history, but we need more than just a season-and-a-half’s worth of production before we can jump on that bandwagon. Now, don’t take this the wrong way—we love Jose. But we can’t forget the likes of Carlos Delgado, George Bell, Joe Carter and John Olerud. With that in mind, we take a quick look at some of the great hitters in the Blue Jays’ history after the jump. While the Blue Jays had limited team success during his tenure, Delgado was a rock for the franchise, blasting 30 or more home runs in an absurd nine straight seasons. His 145 RBIs in 2003 made a team record. 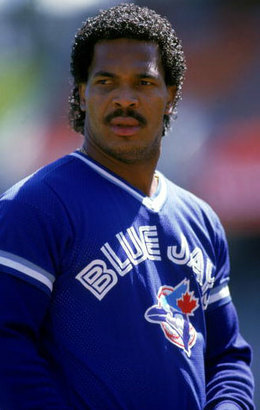 The first Blue Jay to receive a spot on the Level of Excellence, Bell was also the team’s first genuine star—not to mention a lover of the Jheri curl (lookin’ good, George!). Bell hit 20 or more home runs in six seasons in Toronto, including 47 in 1987, when he took home the AL MVP award (he’s still the only Jay ever to do so). Carter could have only hit one home run in his 15 seasons in the big leagues and we would still put him on this list. As it turns out, Carter happens to sit second (behind Delgado) for most career home runs as a Blue Jay. Thank you, Pat Gillick, for making this happen. Never considered a great power hitter, Johnny O’s 1993 season still goes down as one of the most potent in Jays history, carrying a .400 batting average into August and leading the leagues in intentional walks—an impressive feat for a guy who never topped 24 home runs in a single season. It’s a great run, but it’s to early anoint him. And it’s hard to get too excited by surprise HR prowess by anyone after what we saw just a few years ago.